Osmanthus heterophyllus 'Goshiki', false holly, the small reddish leaves represent new growth, while the older leaves have green and yellow variegation. Yep, Goshiki offers pretty a whole rainbow of colors in a single plant! 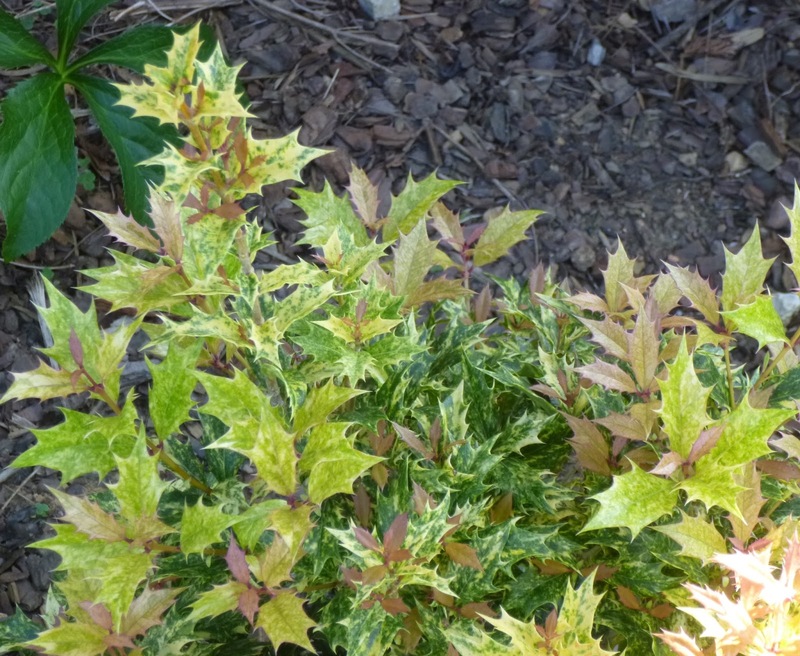 1) I like the fact that it is a broadleaf evergreen shrub. There are not that many broadleaf evergreens that are reliably hardy in Tennessee, but Fred Spicer of the Birmingham Botanical Gardens says that O. heterophyllus should be "rock-hardy" even in USDA zone 6a. 2) Spicer also notes that false holly has excellent drought tolerance in Alabama. 4) Rutgers indicates that false holly is fairly deer resistant ("seldom severely damaged"). 5) Respected plantsman Michael Dirr says O. heterophyllus makes a resilient and virtually impenetrable hedge that can withstand heat, drought and pruning. 6) The Urban Forest Ecosystems Institute says that false holly flowers attract bees, while its fruit provides food for wildlife. Do you grow false holly? If so, what has been your experience with this plant? Is it poisonous, or non-toxic? I can't seem to find any information about that one way or the other. Thank you. The California Poison Control Center lists Osmanthus heterophyllus as a non-toxic plant (http://www.calpoison.org/hcp/KNOW%20YOUR%20PLANTS-plant%20list%20for%20CPCS%2009B.pdf). Please note that "non-toxic" does NOT mean "edible". "The plants in this list are considered to be safe to humans...Keep in mind that even non-toxic plants can cause vomiting in humans and animals. Also children can choke on a plant piece and have gagging or choking. Some plants that are not a problem to humans can be a problem for animals."